Our incident with the pre-production Airlander aircraft on Saturday 18 Nov has resulted in substantial damage. Our initial assessment is that the aircraft detached from its moorings in light winds for reasons that will be determined from our ongoing investigation. The aircraft is now deflated and secure on the edge of the airfield, and is being recovered to Hangar 2 at Cardington.. There were no serious injuries resulting from this ground incident. 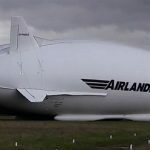 The damage to the Airlander aircraft will result in a claim under our insurance policy of up to £32 million, being the maximum insured value. This incident follows a very successful flight test last Friday. Moreover, we have gained a great deal of data, information and expertise from our previous successful flight tests. We look forward to using the knowledge gained and to working with all our potential military and civil customers to develop and build production standard Airlander aircraft to meet their operational and business needs. While the damage to the aircraft will no doubt impact on our timescales and plans, our successes to date make us confident that Airlander will provide the capabilities and opportunities that will address the $45 billion market that has been independently assessed. This entry was posted in Airships, Hybrid Airships and tagged Airlander, airship, Cardington Hangars, Hybrid Air Vehicles Ltd., hybrid airship. Bookmark the permalink.